They have been given a stain/wash of Minwax Tudor Satin stain. Excess pooling, mainly around the waist of the figures, was removed with a brush dipped in thinner. This is what they looked like with a block paint job prior to the stain. 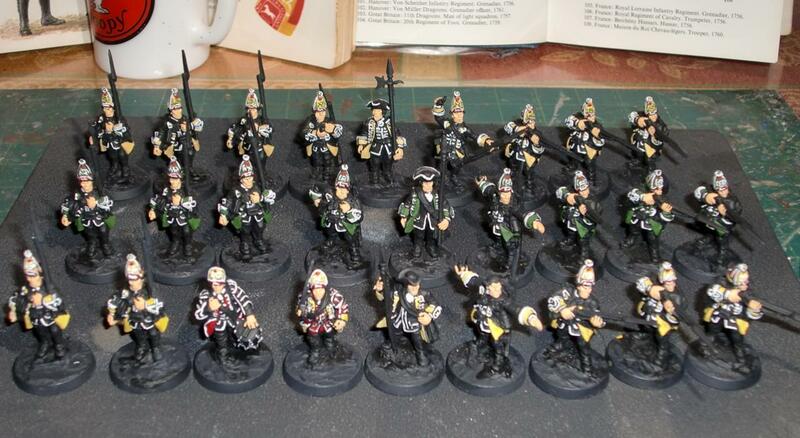 After they are thoroughly dry - probably in a day or so - they'll be given a finish of Testors Dullcote. I probably won't highlight them as they turned out pretty good with just the stain. Likely just work on flocking the bases. 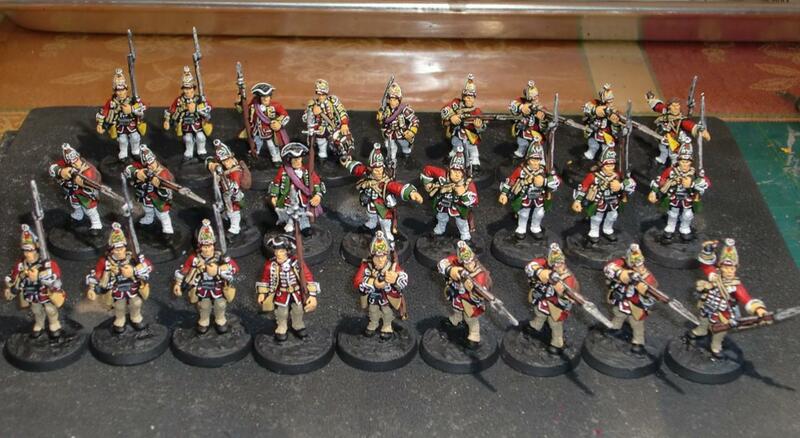 Their French adversaries should be easier to paint - they don't have the elaborate lacing like these British. Added some more paint to these guys. Worked on their mitre caps and some the piping. The Minwax should sharpen stuff like the cap plate details later. 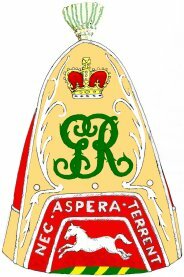 Not having much knowledge about this period, I'm curious as to why the officer's and drummer's caps are different from the rest of them. 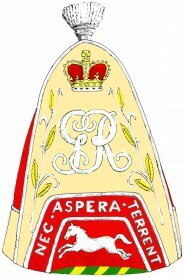 Also wonder why the NCOs have tricornes instead of mitres. Not much to look at right now, but wanted to post a painting update. Slowly adding some color to these guys - so far only the flesh and the facing colors. 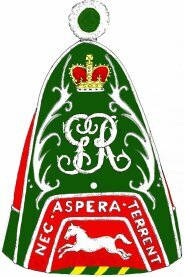 They are going to be Louisbourg Grenadiers with a unit each of the 22nd, 40th and 45th Foot. Probably hard to make out in the photo below, but I tried to give different tones for the two buff colored facings of the 22nd and 40th foot guys. I also see that in my production line painting method, I forgot that the musician should be in reverse colors. Here are the caps for the different units. 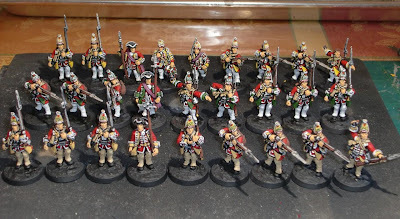 Next will be the white lacing and then the red coats. 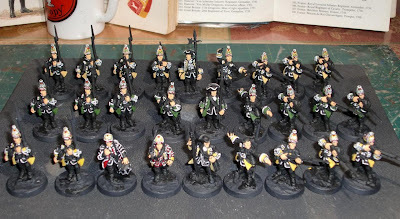 The painting method I'm using is the same as I've used for Napoleonics - black undercoat, leaving certain areas alone to simulate black-lining. Also, plan to use Minwax to bring out the fine details like the those on the caps and lacing. 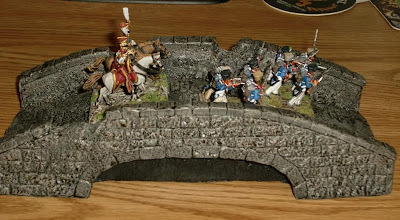 Here's a good deal if you're looking for a nice sized stone bridge - picked it up from Hobby Bunker for $12.00 - less shipping, which is a flat rate of $6.00 in the USA (free for orders over $100.00 - again for the USA). Sorry my UK buddies, but at least you have all the great figure companies (that would be Eureka for the folks Down Under too). Anyway, here it is after I gave it a quick dry-brush of greys, followed by a Minwax stain and finally a coat of Krylon Matte. The finish is not as flat as Testors Dullcote, but Krylon is cheaper and as it is a gaming piece, it'll likely be handled a lot anyway. I may go over it again with a dry-brush to dull it down. 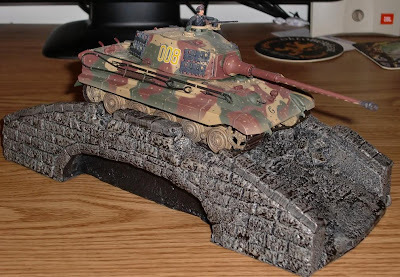 As it's advertised as 54mm, it is quite a good size: 10 1/4" x 4 3/8" x 2 1/2" with 1" arch; Just wide enough for a 1:48th scale King Tiger. 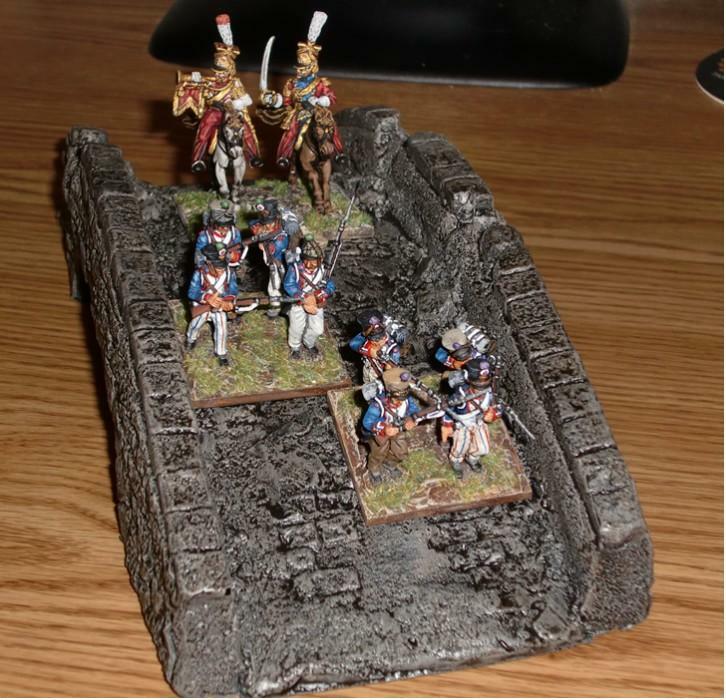 But just shy of 80mm wide - not quite enough to have two stands based for Black Powder to go side by side. Still, quite a bargain, I think. Bolt Action Play Test - Saving Pvt. Ryan - Alamo! 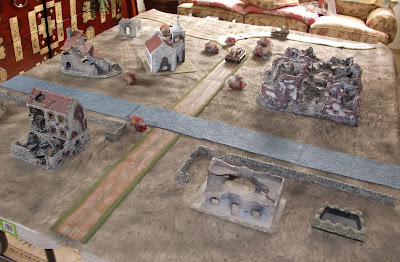 Thanks to my buddies Scott A. and Bob H. (Old Bob on TMP), I managed to flesh out more of the Bolt Action rules using a scenario I plan to use at our annual convention, Enfilade!, in May. I want to also mention the excellent and fast service from FRP Games for getting me some Bolt Action dice in record time. I had just ordered them less than a week ago, and they arrived yesterday - just in time for the play test. We discovered the scenario does need some tweaking though. Bob commanded the Americans and using what I thought was a good initial deployment, had him moving his American 12" from the river on one side of the table. Scott with the Germans entered on the opposite side, 12" from the edge. His Tiger and Marder only being able to come on in Turn 2. Victory conditions for the Americans were to have Captain Hanks getting Private Ryan across the river and into Alamo - and lasting until Turn 6. The Germans had it easier, all they had to do was prevent this from occurring - getting more points for every American unit destroyed. Americans having moved onto one side of the table - and apparently staying away from the bridge and river to oppose the Germans. Americans appear to be using cover and concealment to their advantage. As you can see from the photo above, Bob chose to meet the Germans as they came on the table. I initially believed this was very sporting of Bob, as he could've attempted to just get Private Ryan across the river and hold there. We later found out that this was probably not the best idea as Scott ended up basically occupying all of the defensible terrain opposite the Americans and putting his units in Ambush mode. 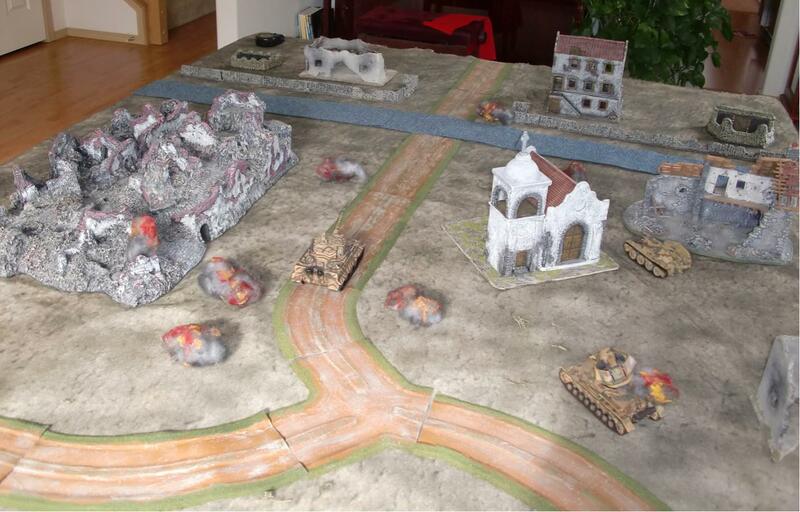 Scott's Germans moving into heavy cover in the ruined town; the Tiger and Marder moving up unopposed. The building at the far end having German MMG teams on the second floor - with another unit downstairs - also all on Ambush. The Sniper team was placed in the tower at the start of the game - he's already been taking hits as the die indicates pins. Captain Hanks trying to get a bazooka team to hit the Tiger. Leave it to Scott, a retired SF guy, to get two MMG teams and also another unit into the building to lay in ambush. This is about when Bob said he'd had enough and let me take over. I managed to get the majority of his Americans killed, including Ryan - right as he about to exit the church and head for the bridge. Reviewing the game, we decided it was best to have all of the Americans start on the table 12" from river. We also thought the Germans only needed one armored vehicle - probably just the Tiger as it looks cooler. We also all agreed the rules are fun and plan to play more games soon. Bob is working on Japanese and Scott has some Early-War SS. More Bolt Action is definitely in the future for us. Just an update of a new project I'm looking forward to working on. 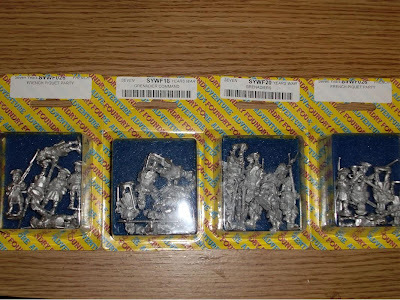 This will be my first venture into "Lace Wars" thanks to my recent trip to the UK where I stopped into the Wargames Foundry and picked up some great SYW figures, and also the fairly recent release of Muskets and Tomahawks by Alex Buchel. I haven't picked up the rule book yet, but read several reviews on the 'net and it sounds perfect for what I'm looking for. 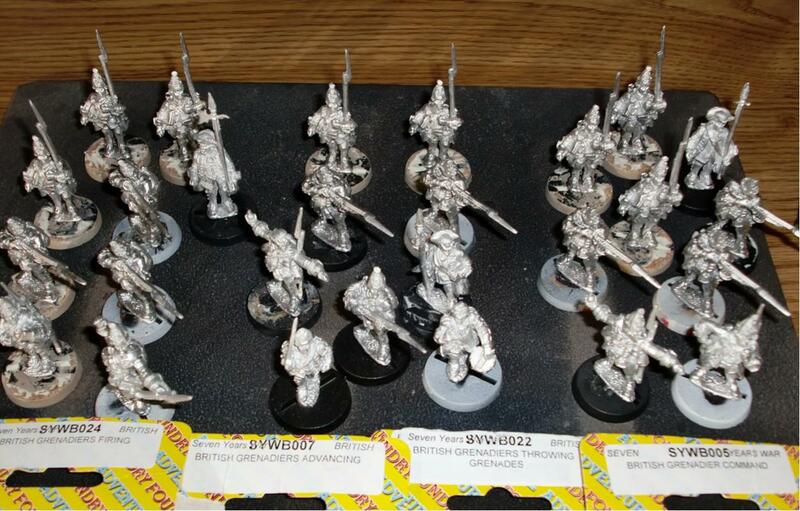 Here is the bare lead of the British force I will be working on - they are some very nice British Grenadiers from Foundry's SYW range. 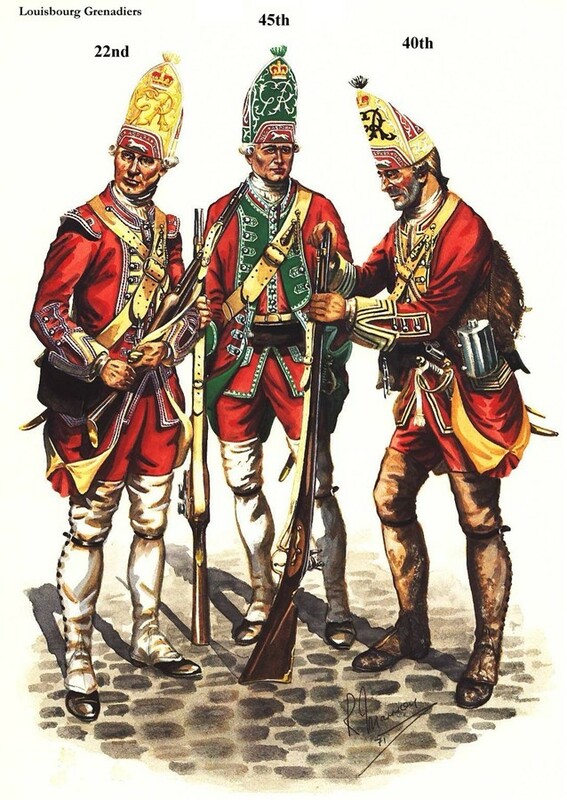 They will be painted up as the 22th, 40th and 45th Grenadiers who were formed by General Wolfe into a provisional unit called the Louisbourg Grenadiers. They participated in many important campaigns and battles during the French and Indian War. Thanks to Neil at the Foundry, I was also able to pick up some French to oppose the British. I plan to start on these after I play test a Bolt Action game this Saturday. Speaking of rules, I've decided to focus on Bolt Action, SAGA and Muskets and Tomahawks for smaller skirmish games; Hail Caesar and Black Powder for larger games; and finally WAB for one-on-one, tournament types of games. Just a quick post to show what I'm working on - a Saving Private Ryan final battle scene using Bolt Action. This will be a game I plan to host at our annual convention, Enfilade!, in May. Actually still reviewing the rules, but they are quite easy to understand, and the recent game fellow blogger Scrivs hosted really helped. Please see Scrivs' blog for a nice write up of that game. Of course, I still need to add the river and bridge. The river will run along the wall on the far side of the table - i.e. the Alamo. 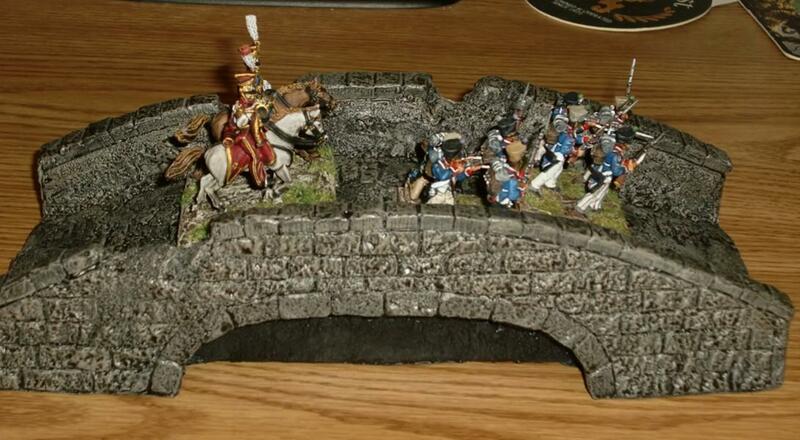 My buddy Pat (aka Socal Warhammer) said he'd let me borrow his river and bridge, but I'd like to get these terrain pieces too as every gamer should have them. More to follow. Thanks for checking out this blog. Maranatha! Well my buddy Pat L. (aka Socal Warhammer) and I just returned from England where we not only participated in the WAB GT, but also managed to see a lot of fine historical sites - and great pubs too. Suffice to say it was an impressively run tournament by Andy Pickering and Phil Vernon. 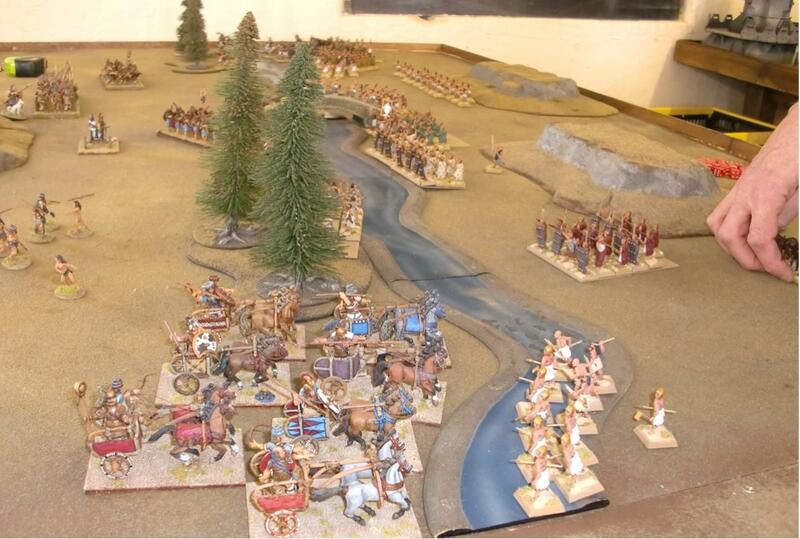 There were 32 players, including Phil, and chock full off experienced players with great armies. The period was all the way from Chariot Wars through 31 B.C. Pat placed a very respectable 7th with his three-elephant strong Seleucid army. I was lucky to end up at 24 (no doubt my early list entry with attendant gimme-points helped toward this). I made several critical (read, stupid) tactical errors in several of my games, but managed to finish with a clear win in game 5. All of my opponents, as well as all entrants as far as I could tell, were very courteous and friendly throughout the tournament - and also after hours at the bar downstairs of the tournament area. Most of the players also went to a fine dinner at a curry house on Saturday night. vs. David Pearson's Sumerians - a tie (my only actual Chariot Wars army opponent). The river was fordable at both flanks, and there was a bridge in the middle. 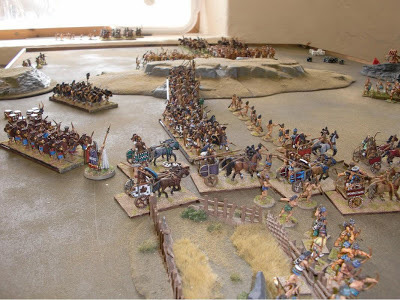 vs. Michael Curtis' (of 1st Corps/Curteys) Warring States Chinese - my loss (his crossbowmen on the hill - taking pot shots at one of my chariot squadrons while his heavy chariots crash into my spearmen). 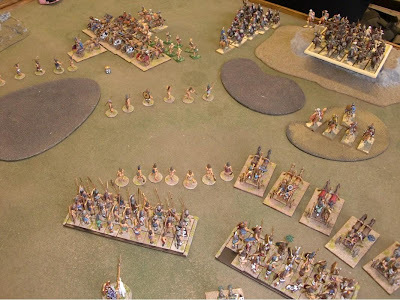 vs. Dave Johnson's Classical Indians - another loss for me (he had troops armed with longbows, as well as elephants and heavy and light chariots - with bows also). My initial deployment of troops didn't help, but Dave did mention he plays WAB twice a week! Thanks for the schooling Dave. vs. Grahame Middleton's Syracusans - the worst defeat for my army; I did some seriously dumb things which I don't even want to recall. Grahame placed 3rd overall by the way - my crushing defeat likely assisting in this. That all said, Grahame is a first class player and gentleman. I really should've done a lot better in this game - maybe I was still feeling the effects of jet lag (yeah, that's what it was). vs. Kerry Rayner's Armenians - my only victory! Kerry played her army very well - which by the way was composed heavily of Nomadic cavalry with all the bells and whistles of the "Expert Cavalry" rule. The terrain probably hindered her a bit with her heavy cavalry, but a bad leadership roll had her allied heavy cavalry flee off the table. I had also managed to chase most of her light cavalry off with my chariots. Kerry was quite the sport as all the rest of the players. This game brightened my day though. 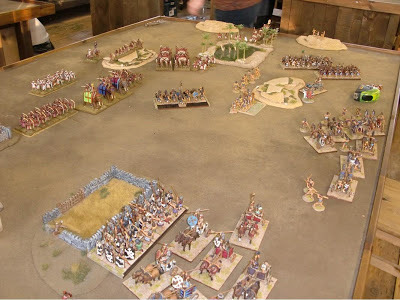 1st Place for the tournament went to one Martin Gibbins with his Seleucid army; Seleucid armies, by the way, were heavily represented at the event. 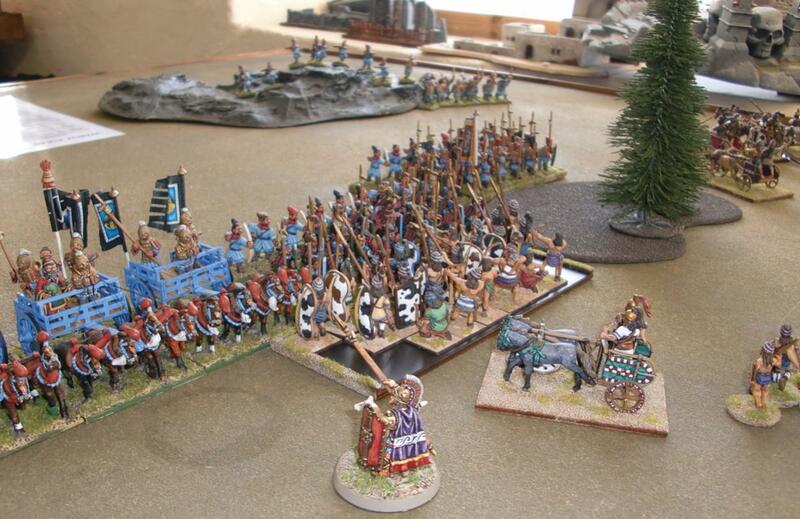 Which reminds me that the Best Painted army went to Mario Kkonnous' splendidly painted one-off Seleucid army. His painting style made me think of fine Renaissance artwork. What is even more amazing is that he sculpted his whole army! I believe the figures will be going into production some time in the near future - keep an eye out for them. A hearty congrats to all the winners, as well as to Andy and Phil for hosting such a great event. The Mansfield Games venue was also first class - plenty of table space upstairs and a built-in pub below with a friendly serving lass. Something missing from this side of the pond, I think. 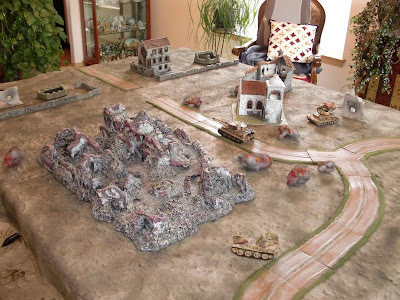 I would also like to thank fellow blogger Paul (aka Scrivsland) for his hospitality at the tournament and also a couple of nights afterward when he hosted a fantastic Bolt Action game for Pat, me and Stuart of Great Escape Games. Please visit Scrivs' blog for a great AAR and photos of this fun game. Exhausting as it was, our visit to England was rewarding. We saw many interesting sites like Old Sarum, Stonehenge and several castles.We also visited the Royal Armouries at Leeds and the Bovington Tank Museum. 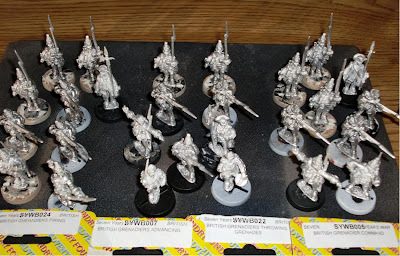 We even managed to pay a visit to The Foundry - and when I say pay, I mean Pat bought another 3K WAB army to paint. Pat had to redistribute his haul of lead so he didn't exceed the weight limitations for his checked luggage. Thanks again to Neil at The Foundry for taking the time to show us around and also giving us some great deals.